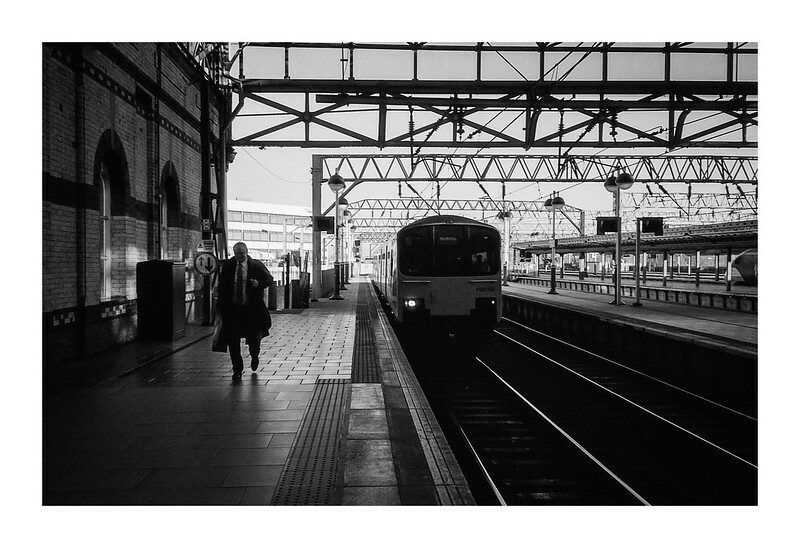 My last shot of the day when visiting Manchester the other week. I like how the sun was catching on the rails and the figure and train set each other off nicely in the frame. 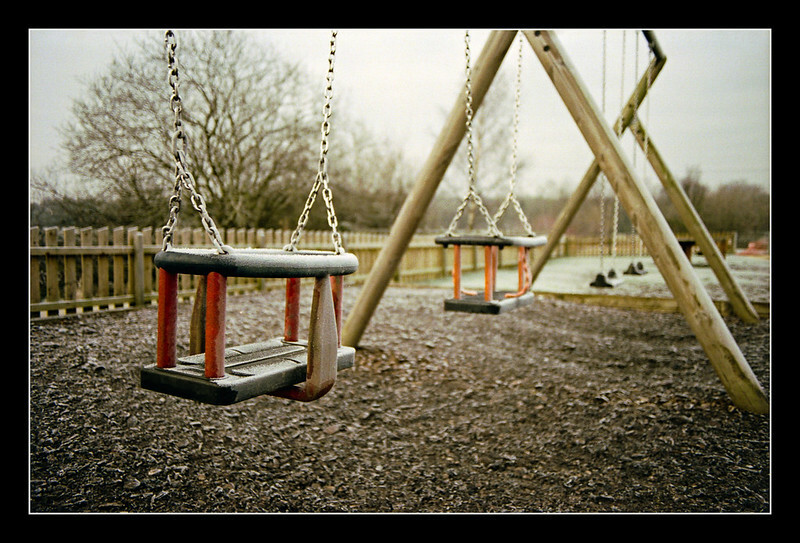 On a walk around the country park on a misty, frosty morning, the playground was deserted and quiet (apart from a couple of geese). Olympus OM-1, Cimko 28mm f/2.8 & Kodak Portra 160. 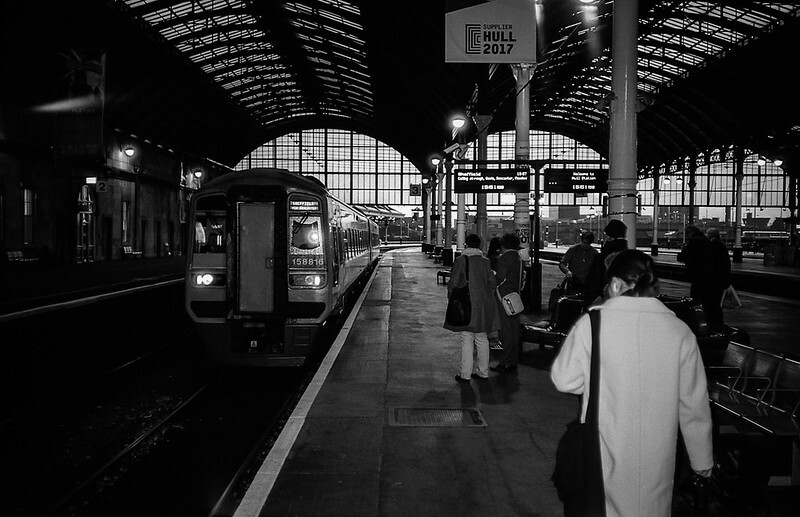 The final shot I took on a recent trip to Hull, taken at the station as my train arrived. 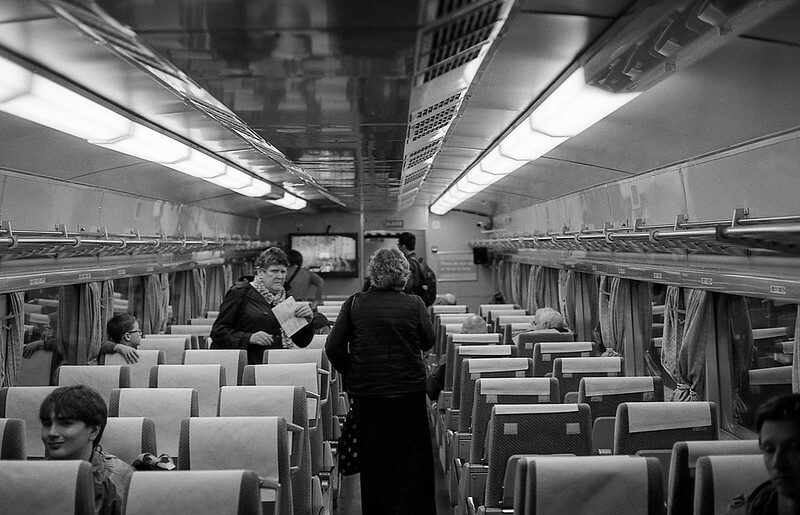 Canon Sure Shot Telemax & Kodak Tri-X. 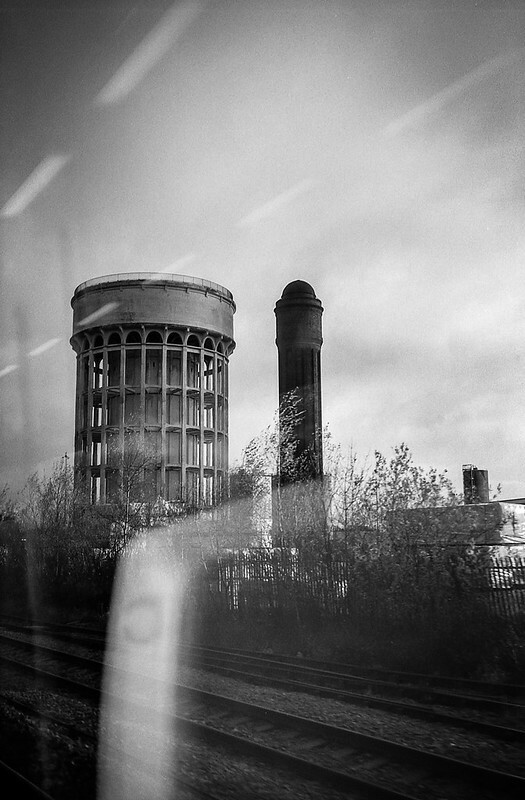 I took this photo from the train on my way to Hull last week. It was a spur of the moment thing, but I’m very happy with the way it turned out. The camera used was a Canon Sure Shot Telemax – a 35mm compact with a 38-70mm f/3.5 – f/6 zoom lens. The camera has the distinction of being the only film camera in my possession that I’ve owned since new – a gift from my parents back in the early 90s. The camera has been sat in a drawer, largely forgotten, and certainly unused for at least the better part of twenty years. The camera actually takes really nice shots, the lens is sharp and produces nice contrasty images. I’m certainly a better photographer now than I was back when this was my only camera, and I reckon I’ve got more good shots from this single roll of HP5+ than I ever got through all the rolls I shot back in the say. It’s certainly not going to be confined to the drawer any longer, that’s for sure. I think its time has come to show what it’s made of! The British summer behaved as expected last weekend, when my wife, her sister and I went on a trip to York, delivering a day of rain and muggy humid conditions. The trip came about because I fancied a photography outing, but didn’t want to leave my wife out if I went somewhere nice, but I similarly didn’t want to feel guilty or limited in what I could do by dragging her around while I took photos, so I suggested she bring her sister so that they could do the shopping thing, while I went off to do my stuff. Anyway, the trip from Sheffield to York takes about an hour, so it’s nothing too onerous to undertake, but the weather definitely put a (literal) dampener on things and so, while the ladies went around the shops, I was forced to find some indoor location myself, and decided upon the National Railway Museum. 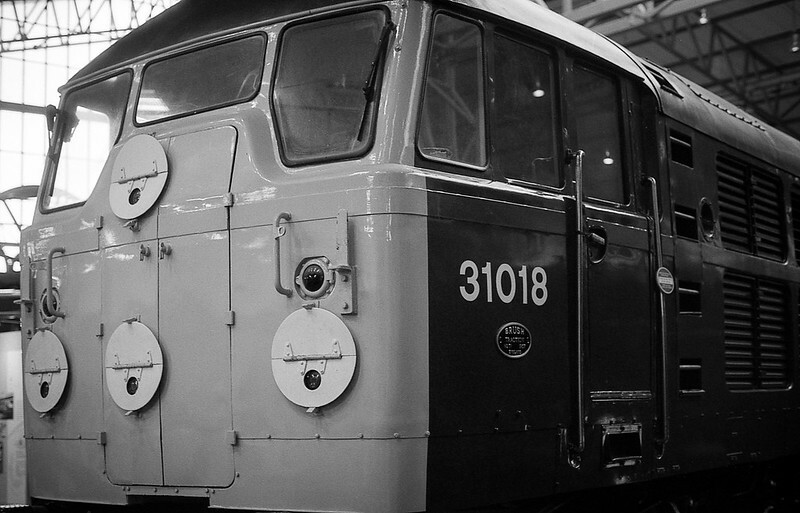 The museum is worth a visit (even if you’re not all that interested in railways), and I’ve been a number of times in my life, both as a child, and then as an adult, with our own kids. 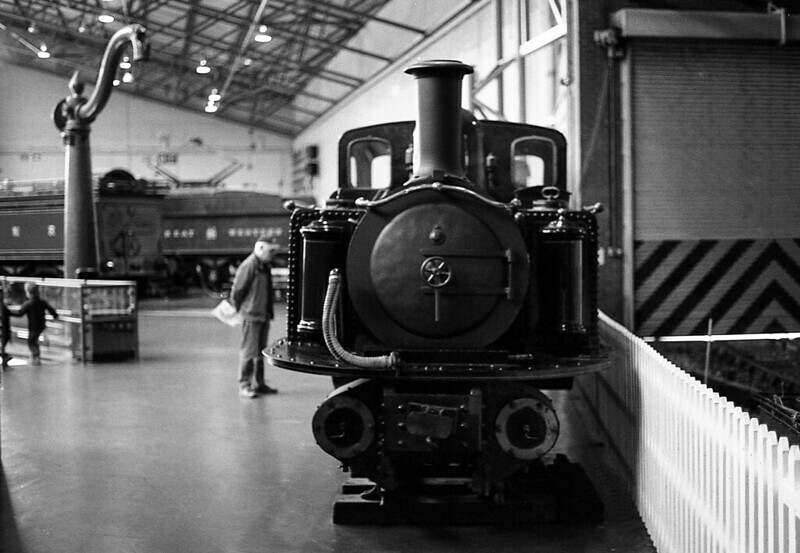 The major downside in the museum, photographically speaking, is that it’s not incredibly well-lit – especially in the hall where the royal trains are housed – and while this isn’t a hindrance to modern digital cameras, where the ISO can be changed on the fly to account for dim light, it’s something of a nuisance for a tripodless film SLR, even with 400 ASA film loaded. So, while I took quite a few shots inside, there were many where I just had to let them go as I would’ve needed far too slow a shutter speed to be able to hand-hold the camera. Oh well. The photos below were taken on the way to, and inside the museum. 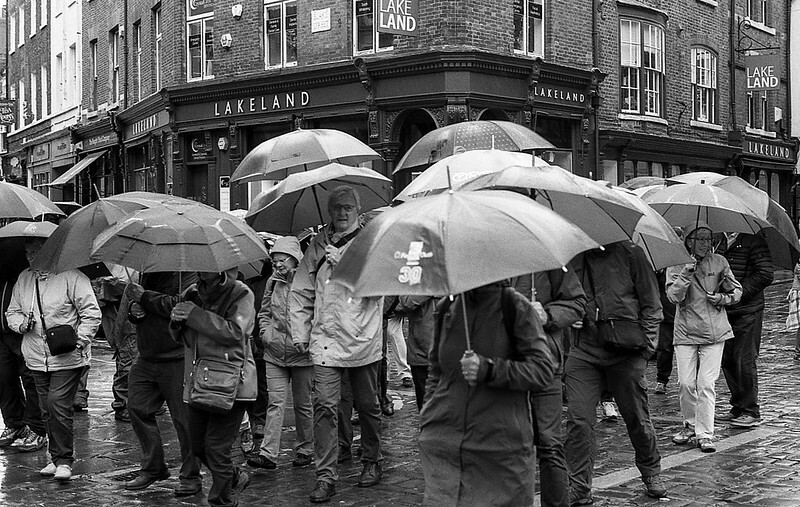 I have a bunch of other shots from the day in York (it did mostly stop raining in the afternoon, thankfully), but I’ll perhaps share those in a future post at some point – plus some of them are on a roll of film that hasn’t been finished as yet. 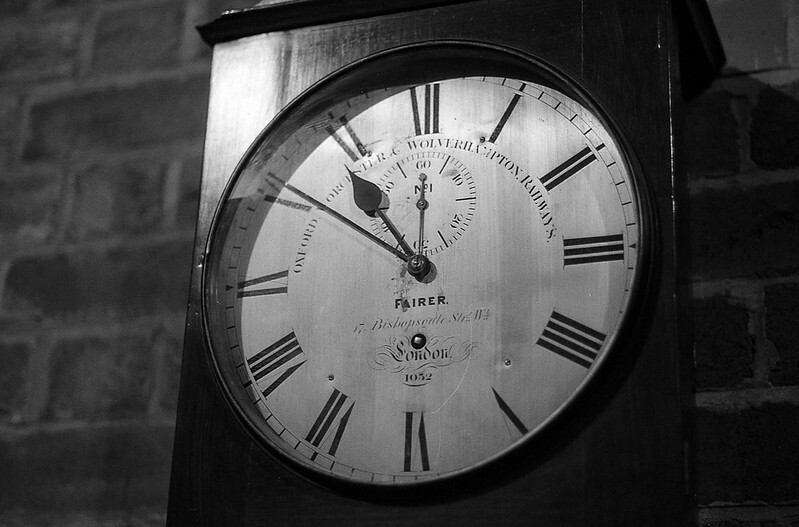 All the shots below were taken with my Olympus OM-1 with a F Zuiko 50mm f/1.8 lens fitted, on Ilford HP5+ film. It’s a lovely camera, and the lens is capable of some very sharp results (although I did lose a couple on the day thanks to camera shake in the low light). #1 & #2 – While heading towards the museum, I spotted a tour group in the town centre. 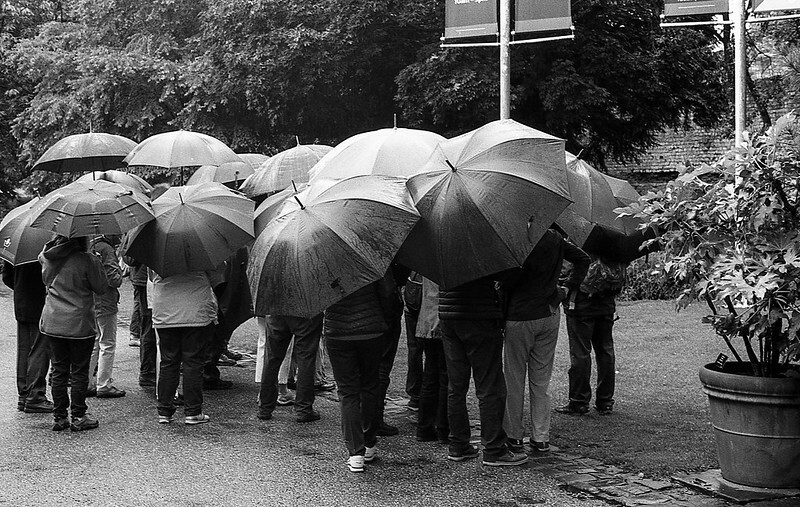 As the rain was coming down quite hard, they were all holding umbrellas, and I thought they were worth a shot or two. Sadly, just as I got the camera out of my bag and focussed, the group decided to move on, which is why there’s a degree of motion in the first shot. Still, I decided to follow them to their next point of interest and got a more satisfying second shot. 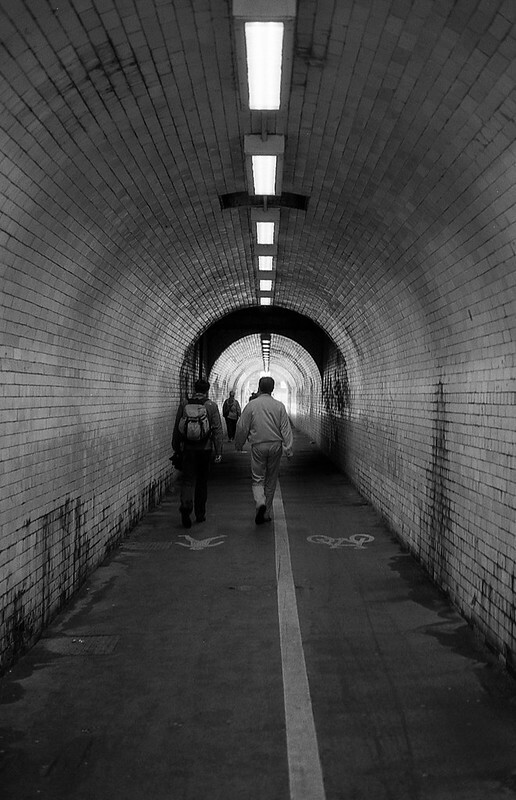 #3 – Just before you arrive at the National Railway Museum if coming from the town centre), the road goes beneath the norther edge of York railway station, and there is a separate tunnel for pedestrians and cyclists. 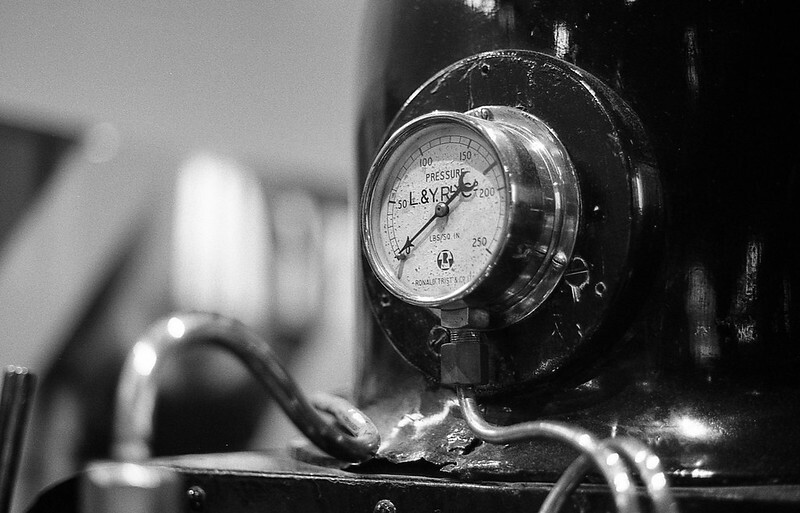 #4 – Just inside the museum, next to the reception area, is a steam engine of some sort, and I spotted this interesting-looking gauge on the dome. #5 – In the Station Hall section of the museum I was very limited by the available light, and only took a couple of shots – one of which had awful camera shake. If the day had been brighter, then the skylights would have let in much more illumination, but not on this visit unfortunately, so this is the only shot I got in there. It’s a shame as there are lots of things of interest in here, both for the museum visitor and the photographer looking for interesting subjects. #6 & #7 – The other main section of the museum is the Great Hall. This section houses most of the locomotives and has an operating turntable that is demonstrated at set times throughout the day. 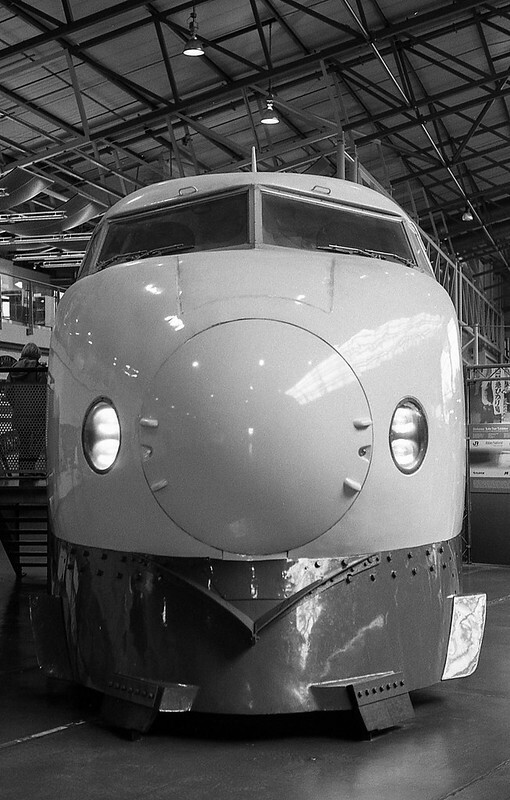 One of the first things you see in the Great Hall is a Japanese Bullet Train, and you are able to board the single carriage and watch films that are screened at either end of the compartment. I seem to be receiving a concerned or disapproving look from the lady in the second shot, although I didn’t really notice her at the time of taking the picture. 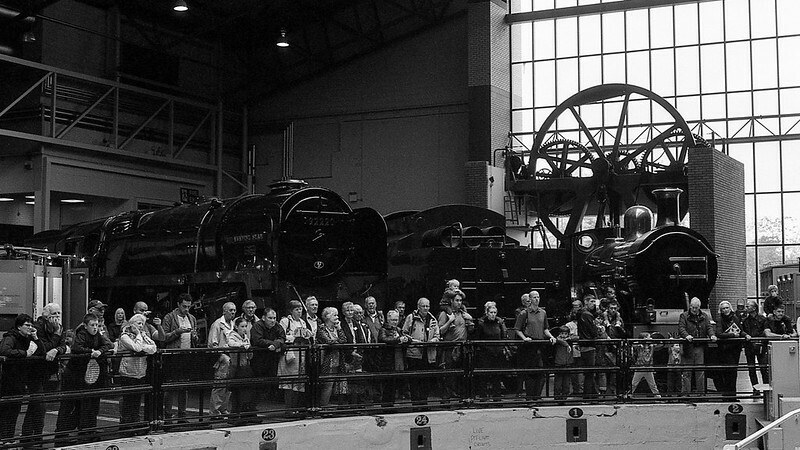 #8 – The main feature of the Great Hall is the turntable, and the first shot here shows a group of spectators waiting for a demonstration to begin. 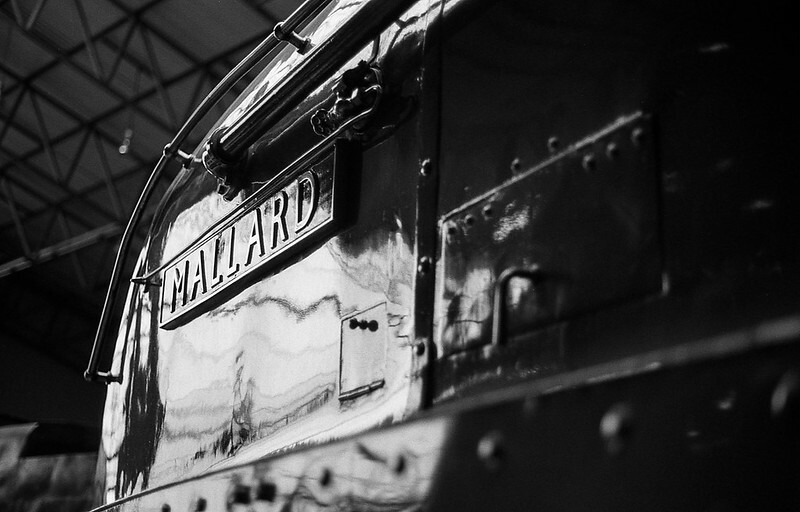 #9, #10, #11 & 12 – show details of some of the locomotives arranged around the turntable, and these shots show a replica of Stephenson’s Rocket, the Mallard, the Evening Star (Britain’s last steam locomotive run by British Railways) and a Class 31 diesel locomotive. 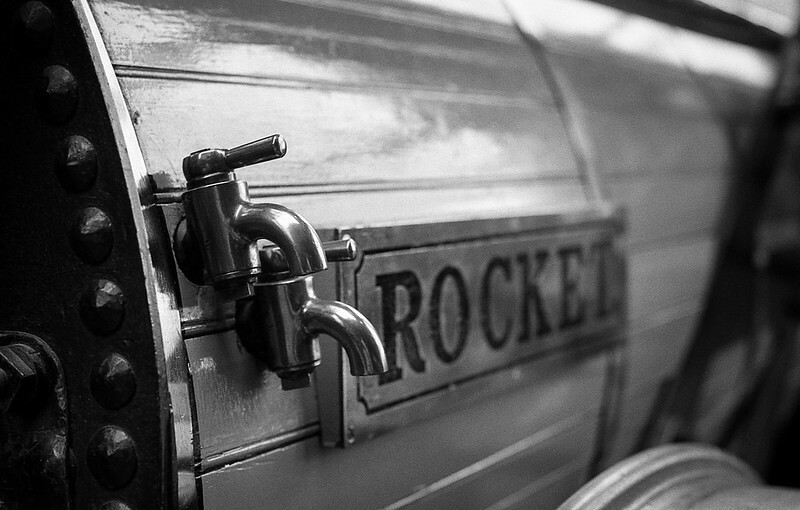 #13 – Also in the Great Hall was this odd little locomotive off to one side of the larger specimens. 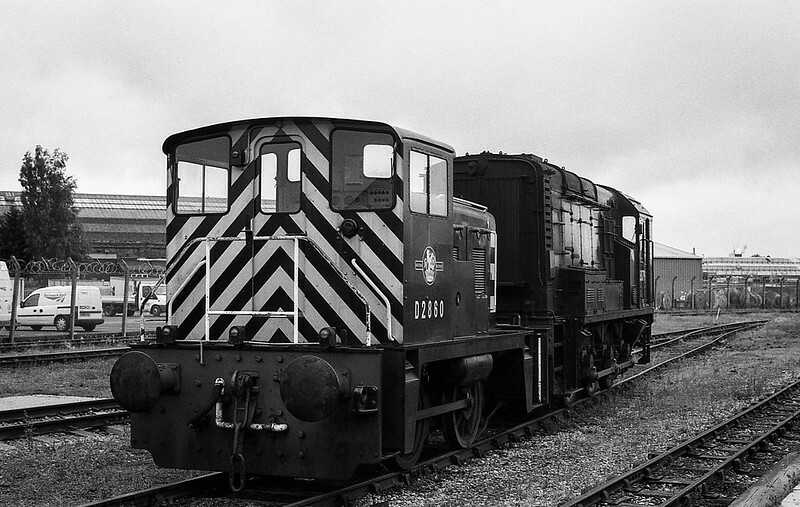 #14 – The final shot I’m including here is of a couple of diesel shunters that were stood outside the Station Hall. I have to say that I’ve a new-found love for Ilford HP5+. 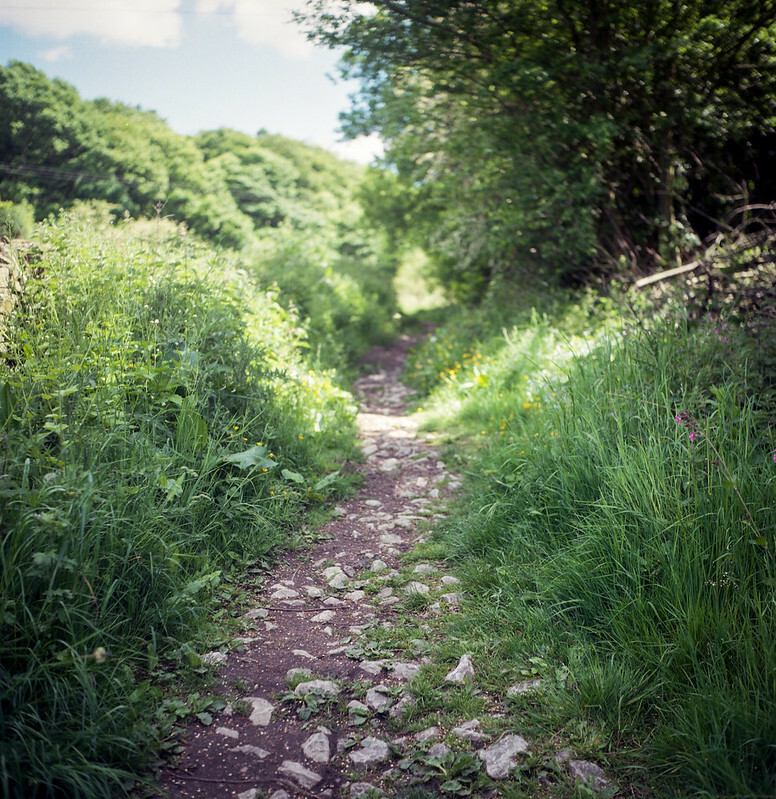 My early attempts with it resulted in slightly flat, grey images that I wasn’t top happy with, but I’ve now realised that this was a fault of the photographer and not the film, and my recent shots have been far nicer in their tones. Last Tuesday I had a day off work, mostly because I had an appointment to keep in the morning (which turned out to be a waste of time thanks to one of the parties not turning up! 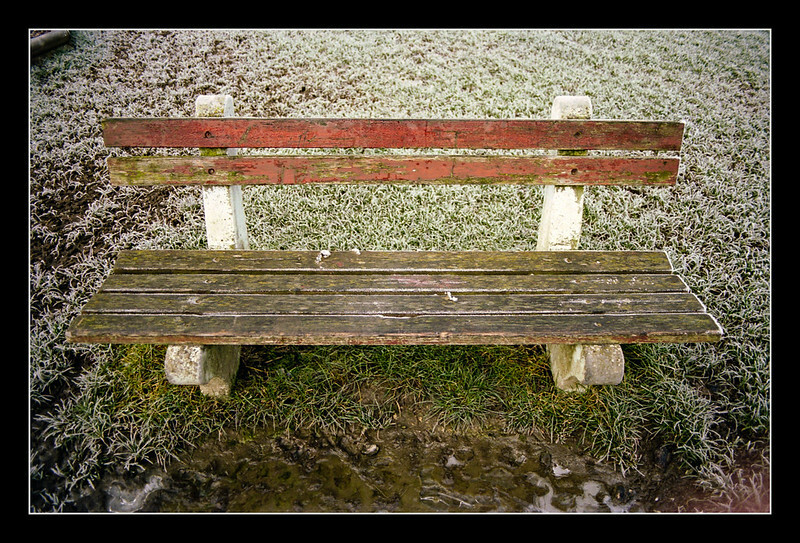 ), but it also meant I had a chance to travel up to Barnsley to see the RPS International Print Exhibition #159 that was on show at The Civic until the end of the month. 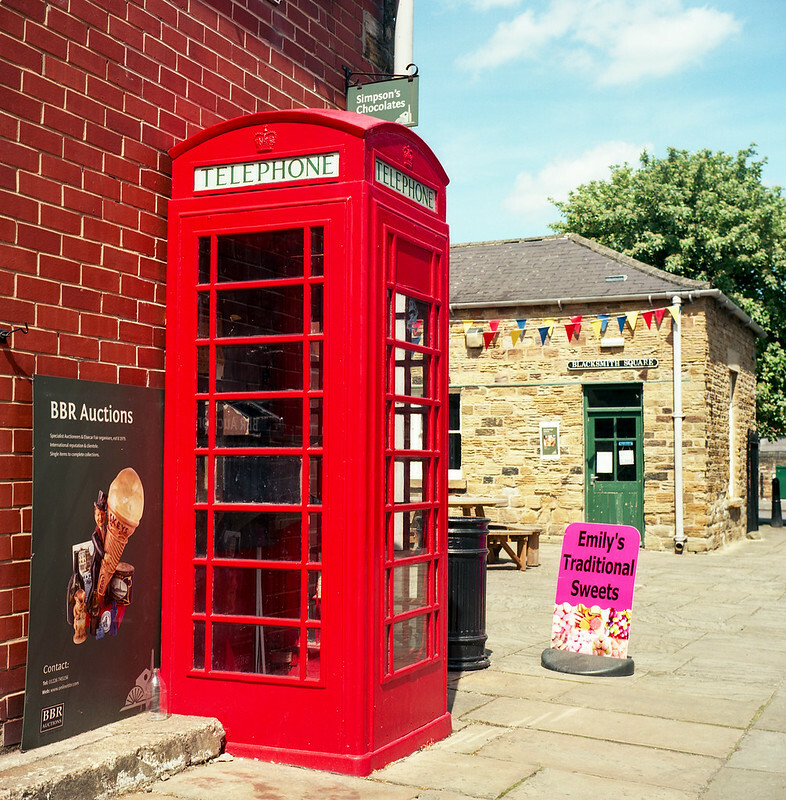 I decided that I’d see the exhibition, then perhaps take a few shots around Barnsley town centre, and then visit Elsecar Heritage Centre (and perhaps Wentworth) on the way back home, and so took my Yashica Mat 124 G loaded with a roll of Kodak Ektar, and also my Olympus 35 RC (with some Kodacolor 200 in it). While I took a number of sots with the 35 RC, I’ve not had the roll processed as yet, so all the shots in this post are from the Yashica. The exhibition was worth the visit and I took notes of some of the photographers whose pictures I liked so that I could look into their work more closely later. The exhibition ends this month in Barnsley and then moves on to a new venue elsewhere in the country I believe. 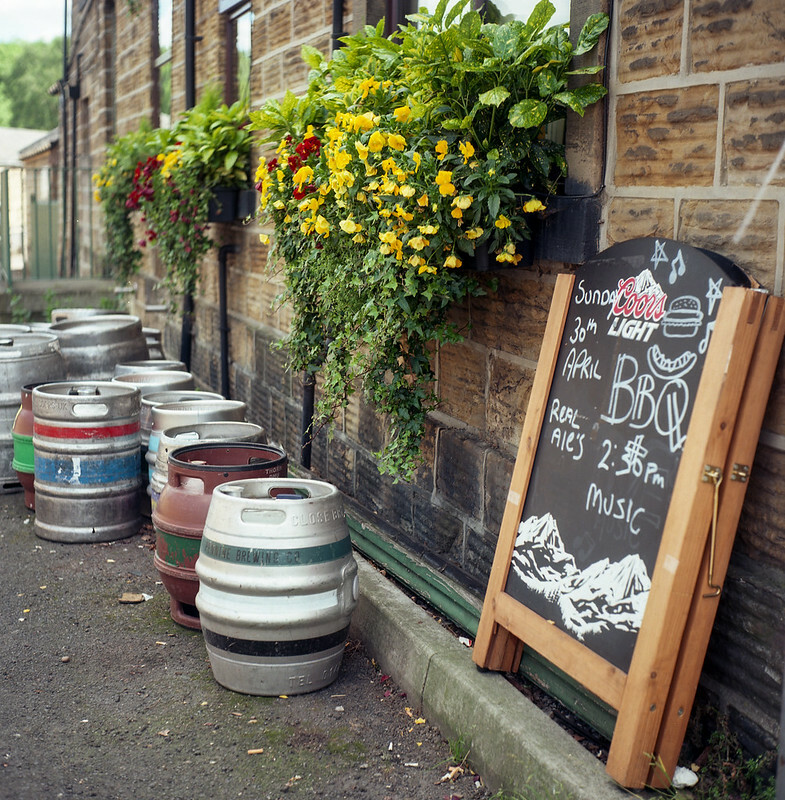 Despite Barnsley being only a short distance from Sheffield, it’s a place I’ve visited rarely – I’ve been maybe half a dozen times in my life – and so there was quite a lot of interesting things to photograph. 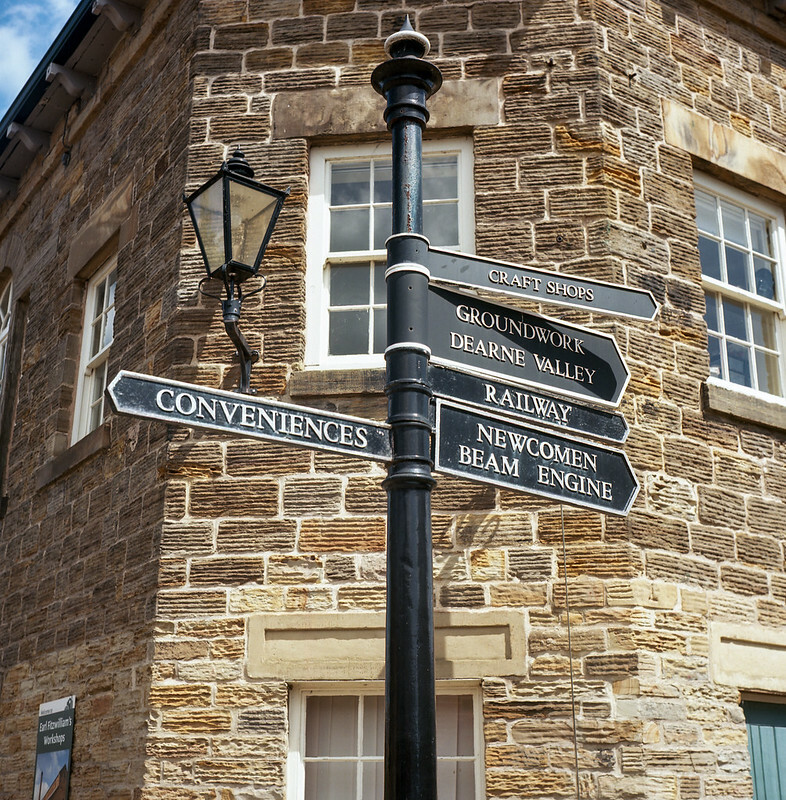 However, as my plan was to go to Elsecar, I only shot a few frames in the town, mostly in the area just behind The Civic, where the exhibition was hosted. Three shots were of a bar / restaurant called The Old Chemist. 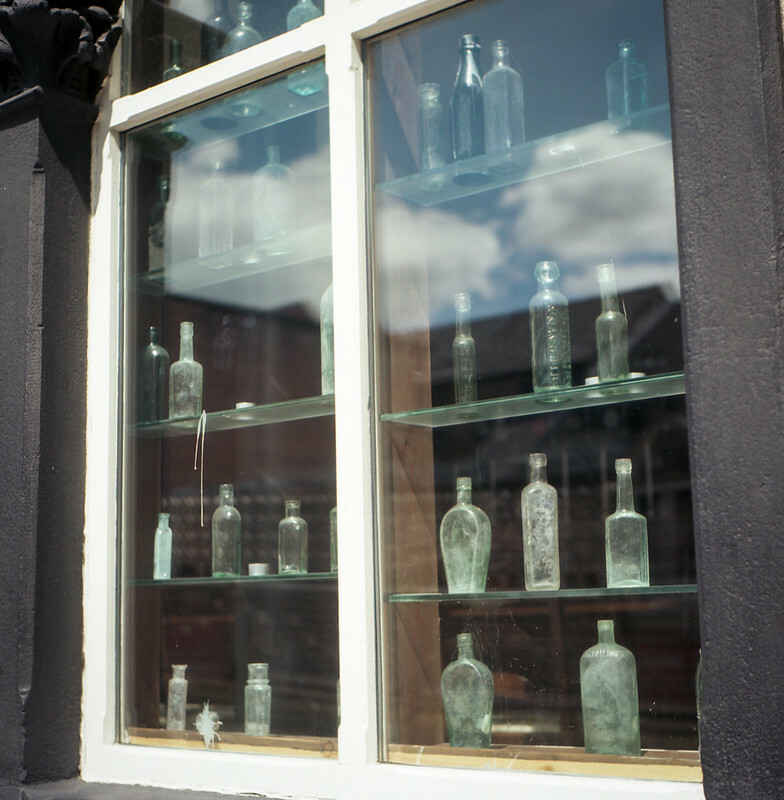 The place has, as its name wold suggest, an old apothecary style theme, and the windows are lined with vintage and antique bottles, and there’s an old-style gas-lamp on the corner (probably not gas-powered any longer). I think the third of these three is my favourite. 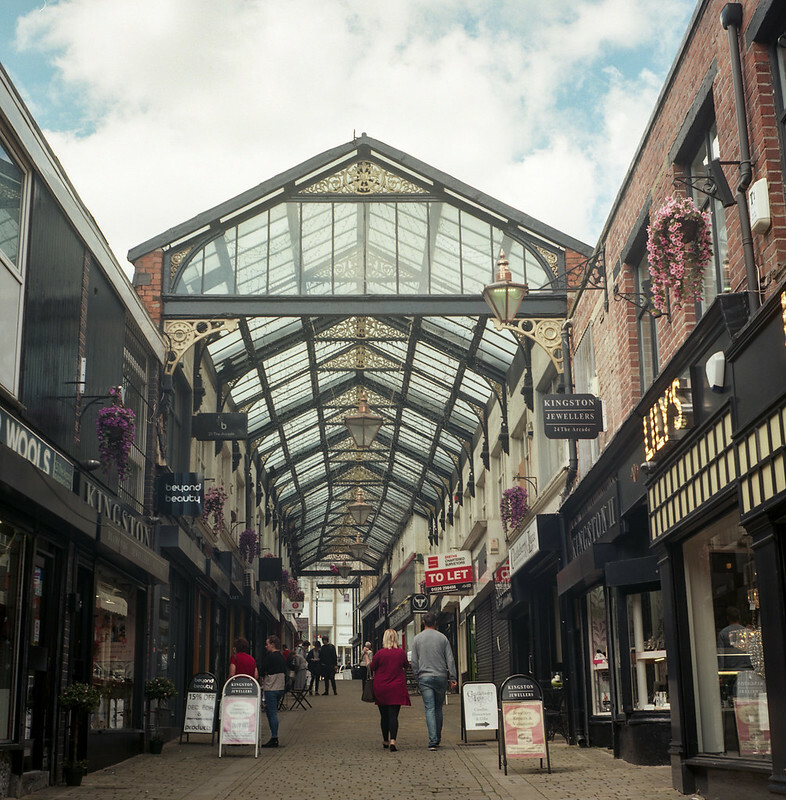 The final shot I took with the Yashica in Barnsley was of The Arcade, a pleasant pedestrian shopping row with an ornate glass ceiling. The shot’s ok, but it’s a little meh too. Better light would have helped, I think (the sun kept disappearing behind clouds – usually a second after I’d taken a meter reading – and I didn’t have time to hang around for the perfect conditions), and would have allowed me to use a smaller aperture. After returning to the car (and taking a few random snaps with the 35 RC) I set off out of Barnsley, down the M1, and to Elsecar (after a quick stop at KFC for a bit to eat. I sat in the car to eat and listened to the awful unfolding news about the previous night’s terror attack on the Ariana Grande concert in Manchester). 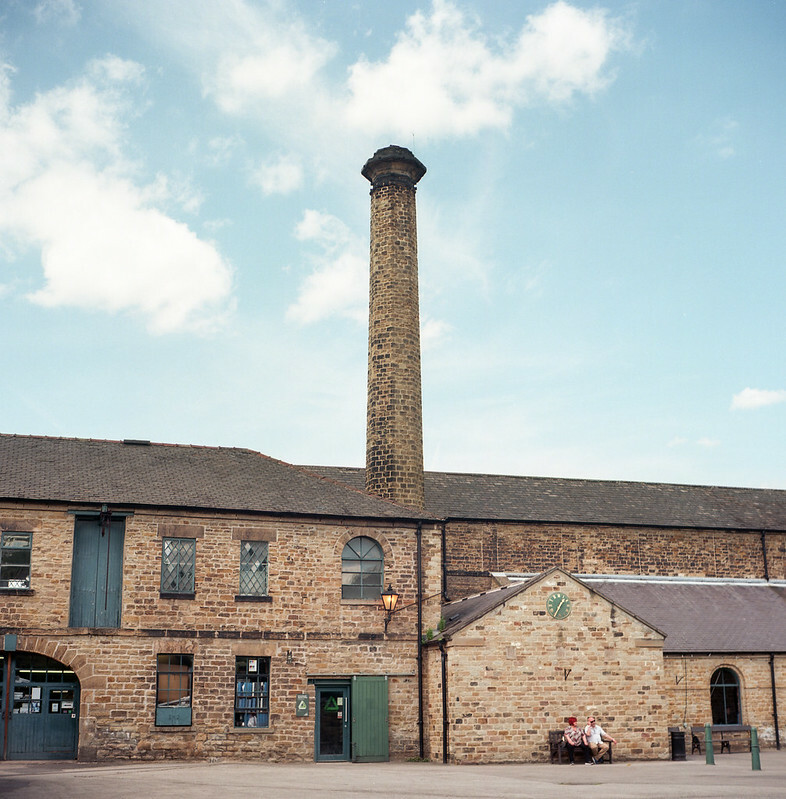 Elsecar Heritage Centre is located on the site of a former ironworks and steam railway. 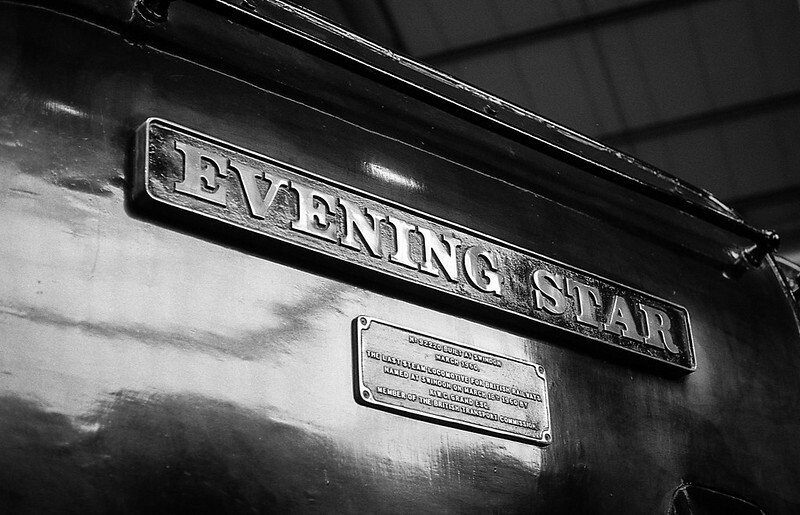 The railway still exists as a heritage line and runs a short distance from the centre. 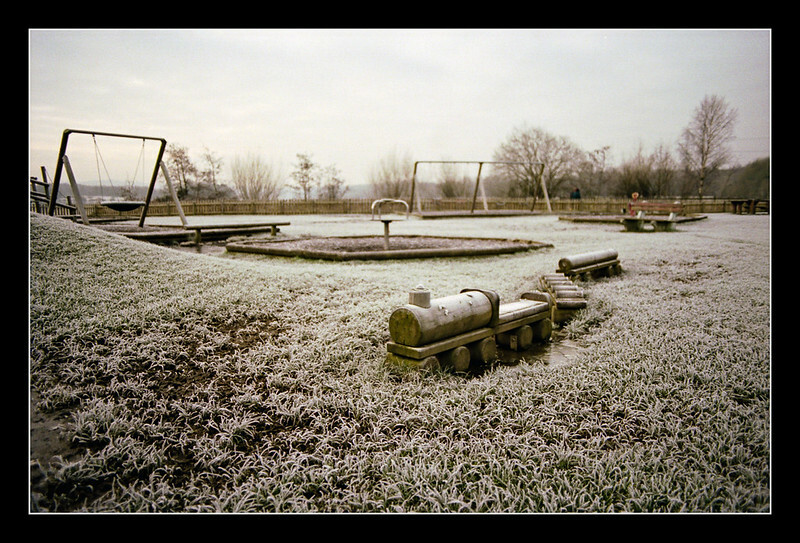 I’ve been on the train-ride several times as, at Christmas, there are special trips where Father Christmas is on board and gives the children presents while their parents have a cup of hot-chocolate or mulled wine. It was all very festive, but my kids have outgrown such things now. The station is small, but quite nicely appointed with a vintage feel to it, and I took three shots. 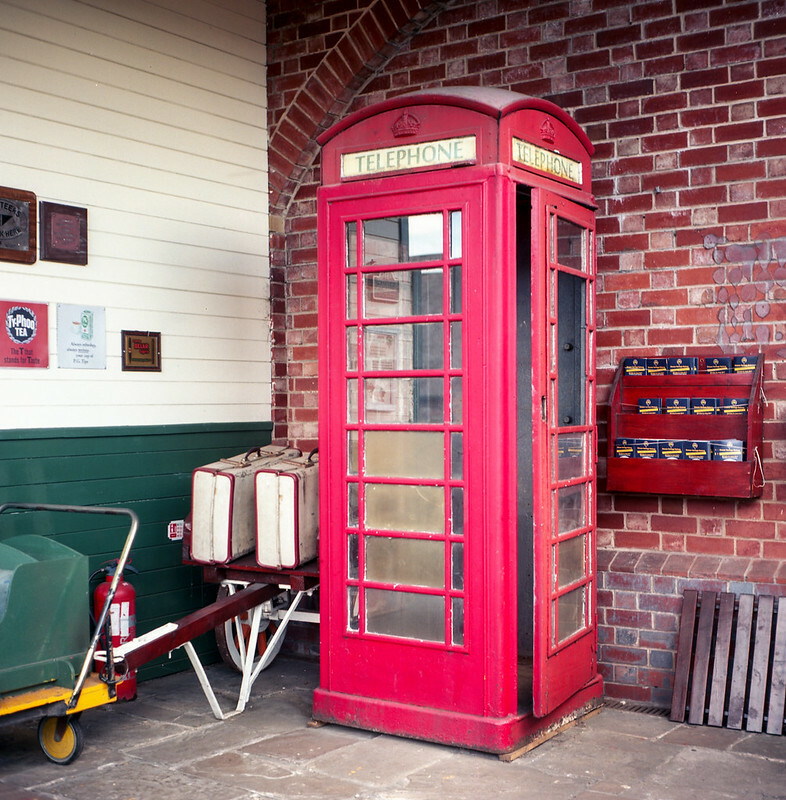 The first is of an old phone box tucked into a corner of the station building. The colour looks a little off, but that is the actual tone of the phonebox, which I suspect has either faded slightly in the sunlight, or maybe been painted an incorrect shade at some point. 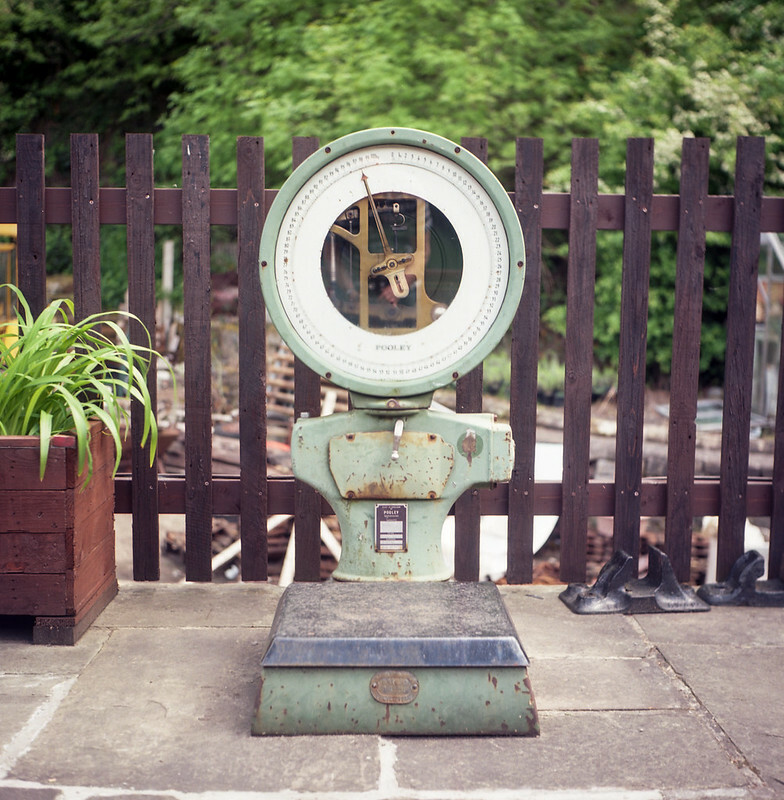 Next is an old set of scales that were on the platform. This ought to have made for a nice shot, but I’ve missed focus ever so slightly, so it’s a little disappointing. 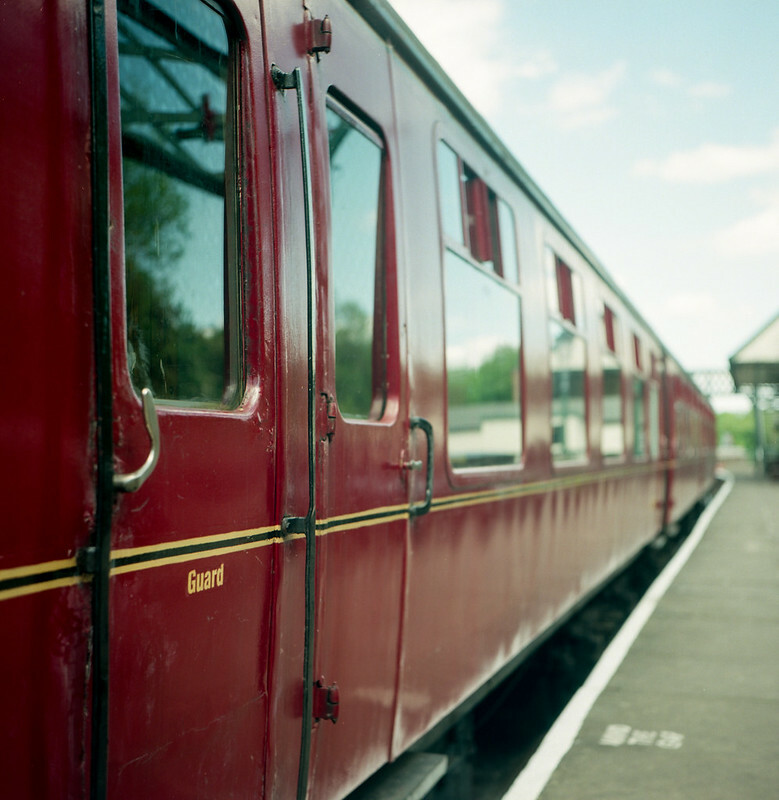 And here is a shot of a set of vintage carriages that were pulled in at the station (there were a few old locomotives too, but I couldn’t get a decent composition on any of them). I think this shot is probably my favourite from the day. Walking out of the station alongside the railway line leads to an old Newcomen beam-engine, the only one remaining in the world still situated in its original location. Sadly, I couldn’t find a composition of this that I liked either and so, instead, took this photo of a nearby footpath leading up the hill towards Wentworth. After this, I walked back into the heritage centre area proper and took the next three photographs. 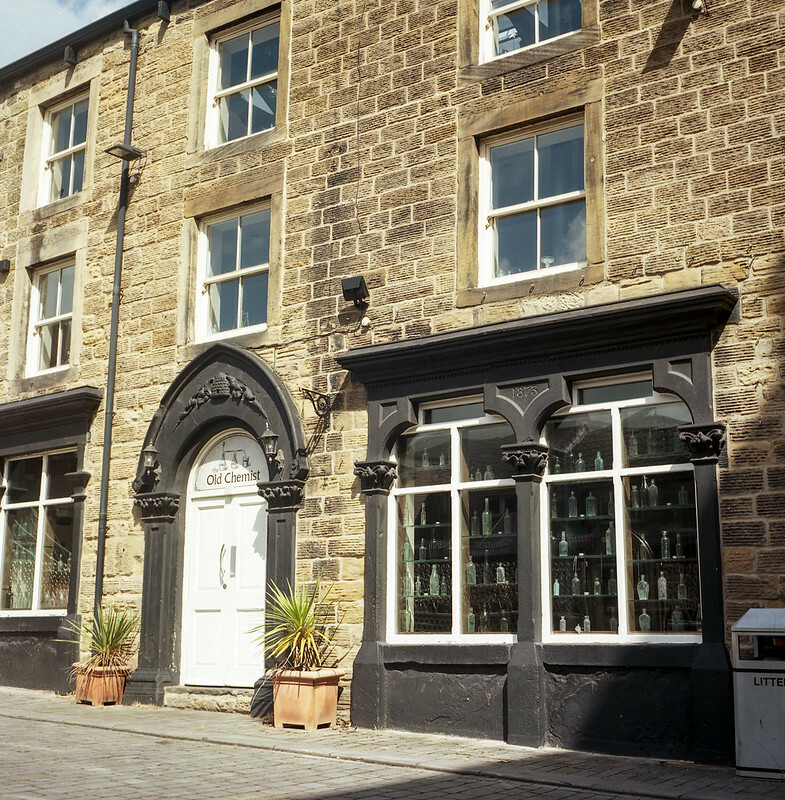 Most of the buildings are now given over t shops and other commercial enterprises (there’s a large children’s play area in the main building – again, we used to take our kids there sometimes when they were younger), and one of them is a large antiques shop. I spent most of my time in here to be honest, and it’s a lovely Aladdin’s Cave of a place. They had a few old film cameras for sale, but I resisted the urge to buy any! It was upon leaving this place that I realised my phone battery had decided to kill itself and was now bereft of any power, leaving me with no way to meter my shots other than Sunny 16 estimation. Luckily, the day was now quite bright and I managed to get my estimations close to the mark and all the remaining shots were well exposed. I’ve decided to buy a dedicated meter though so this doesn’t happen again. 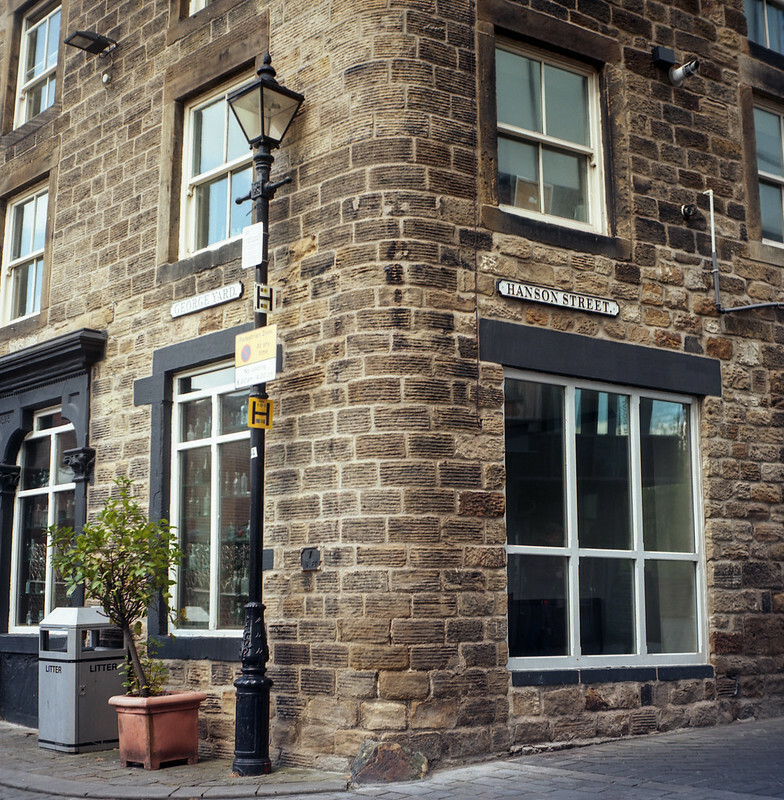 Back to the shots, and I’m in awe at the saturated colours that can be seen in the phone box shot (this was the first roll of Ektar I’ve shot), but the long shot of the foundry building and chimney is the best of the three, I think.